In separate bowl, combine wet ingredients (the rest except for blueberries). You can mash the bananas if you want, but I usually puree them with the rest of the wet ingredients, which results in smoother muffins. Combine wet and dry ingredients, stirring until fully mixed. Drop batter into muffin liners and bake for 20 minutes or until cooked through. 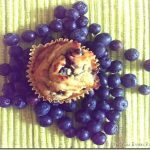 You can add honey if you want to result in a slightly sweeter muffin, but I don’t bother – bananas are plenty sweet for me! If they don’t taste sweet enough right after coming out of the oven, refrigerate them overnight. I promise they’ll taste sweeter!